From Dungiven in Northern Ireland. 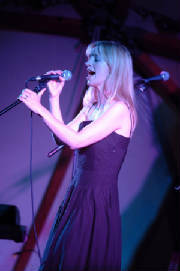 Formerly a member of UK folk-rock group Equation (in which she replaced Kate Rusby), she now performs in a duo with her husband Sam Lakeman. Her unique blend of folk and rock has gained her critical acclaim all over the world. Her voice and piano based compositions have earned her well deserved comparisons to Kate Bush, as well as Joni Mitchell. She and her husband have been known to blend modern influences into ancient songs to make them appeal to modern society. One of the incredible things about this singer is her ability to capture an audience. This is partly what has earned her comparison to rockstar peers. Her dedicated fanbase is something many of her rival folk artists would give there right hands for. The Broken Bridge is a wonderful resource for any new fans of Cara's music. In fact, the artist and her producer/husband Sam themselves have been known to post comments there. In 2002 Cara was nominated for four BBC Folk Awards, of which she received two: Best Traditional Track (for Black Is the Colour) and the Horizon Award (Best Newcomer). In the same year she also won Best Traditional Act at the Hotpress Irish Music Awards. She has also won one of the most prestigious awards in Ireland, Best Irish Female Artist at the 2004 Meteor Irish Music Awards and the Irish Tatler Music Award in 2004. Cara Dillon's third solo album, After the Morning was released in February of 2006. It was her most eagerly anticipated to date, and justifiably so. The album has flavours of bluegrass/country and has been in the making since late 2004. Some known tracks include Streets Of Derry (a duet with Paul Brady), Grace & Garden Valley, which was originally written by Dougie Maclean. of this Irish band from 1991-1995.